With every passing day, amidst chasing our goals and targets, we often forget to focus on ourselves. We rarely focus on what truly makes us happy, rejuvenates us, and gives us contentment. On World Health Day, let’s focus on those little things that give us peace of mind in a real sense. These days, due to our hectic schedules, art has taken a sideline in our lives. Art helps us reconstruct our thought process and refreshes our mind. According to research done by leading counsellors and therapists, art is the best form of therapy and help us align our focus and surround us with positivity. Art doesn’t see any age or gender. When you inculcate art in your day to day lives, you attract optimistic thoughts and indulge in something that helps you keep any sort of toxicity away. Let’ understand what is art therapy and how does it benefit our health. Kids and youngsters these days often go off-track due to addiction to several weird habits that have adverse effects on their health. That’s when art steps into the picture. More they inculcate art into their daily lives, more they’ll stay away from negativity. Our day starts with answering work calls, replying to emails, taking care of the household and family, chasing and meeting targets, so on and so forth. This leads to nothing but increases in stress levels. Stress is a major reason for various diseases like high blood pressure, anxiousness, migraine, heart diseases, etc. The best way to avoid them and unnecessary medications are by introducing art in your everyday schedule. The more you’re connected to your hobbies and things that relieve your stress, the more healthier you and your mind will be. Studies show that individuals who have more confidence and social skills are more likely to develop healthy habits. Art therapy helps build the self-awareness and self-esteem necessary to tackle various social situations and life challenges. Distractions from an addiction can be very liberating and refreshing. Art, in any form, can help people to focus on the positive while keeping their minds off of cravings and negative thoughts. By opening the mind, art therapy encourages people to seek smart solutions to problems rather than rely on drugs or alcohol. This is especially helpful in young adults who may struggle with fitting in or keeping up with the rapid changes in their lives. Art has the ability to inspire people and make them see things from a different perspective. Whether it’s painting a portrait, writing a story or playing a piece of music, art stimulates the brain and encourages positive actions in people’s lives. Through artistic expression, people are able to communicate thoughts, ideas or fears in a way that verbal communication is sometimes incapable of. They could even discover something about themselves they didn’t know. On this World Health Day, let’s pledge to focus on our minds in a creative and artistic way. 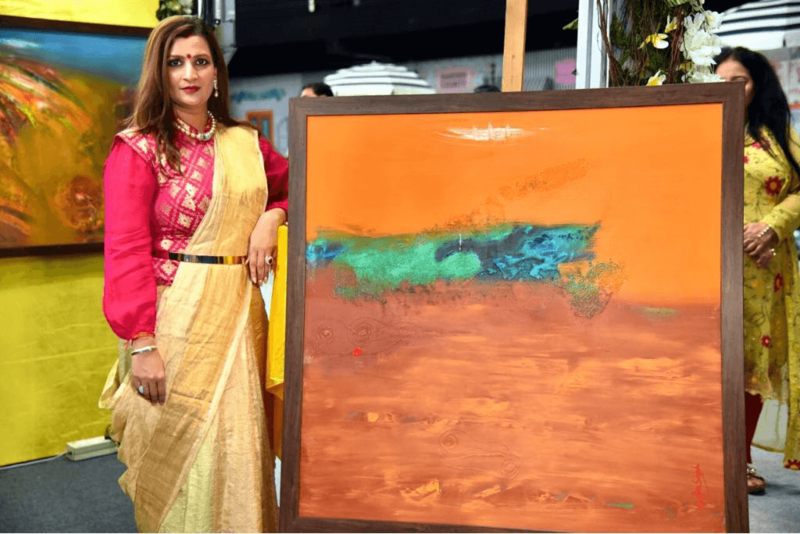 This article has been contributed by Krupa Shah- an acclaimed virtuoso Indian artist who heads Krupa Arts. She has been an active member of FICCI, All Ladies League and Women Economic Forum. With commendable on-ground work and relentless contribution to the field of art - Krupa has earned both, rewards and awards.